There are a number of reasons why Ozzy Osbourne’s solo debut, Blizzard of Ozz, which was released on Sept. 20, 1980, is one of the greatest albums in the history of metal. First, it was a stunning comeback from an artist who seemed completely stricken down and burned out. In late 1978, after recording, eight albums with Black Sabbath, Osbourne was coming apart at the seams. Incapacitated by drugs and alcohol and dealing with debilitating writer’s block, he went AWOL and missed six weeks of rehearsal with the band. Ultimately, the other members of Sabbath – who had severe alcohol and drug problems of their own – decided they couldn’t move forward anymore with Osbourne. At that point, Osbourne was living in a run-down hotel he could barely afford since he had spent so much money on cocaine and booze. He had lost his wife, his band, his self-esteem and, he thought, his charisma. But Sharon Arden, the daughter of Black Sabbath’s manager, Don Arden, felt that Osbourne had been the star of the show when he was onstage with Sabbath and could still be a part of something exceptional. So she took him under her wing, first as a friend and then as a manager and restored his confidence as a performer. Then she worked with him to put together a new lineup of musicians. Initially, they wanted to recruit guitarist Gary Moore, but he wasn’t interested, so, at the suggestion of Ozzy’s friend Dana Strum, they tracked down a young, virtuosic guitar player named Randy Rhoads. From that point until March 19, 1982, Rhoads was Ozzy’s not-so-secret weapon. To complete the lineup, Ozzy wanted Strum to play bass, but that didn’t work out so he added ex-Uriah Heep bassist Bob Daisley and one of Ozzy’s friends, Barry Screnage, as their temporary drummer. With new blood, strong musicianship and excellent chemistry, Rhoads, Daisley and Osbourne started writing at a live-in studio in Monmouth, Wales. In early 1980 the band demoed three of their strongest and most popular songs, “Crazy Train,” “I Don’t Know” and “Goodbye to Romance” with drummer Dixie Lee. Realizing they needed someone who could keep a more powerful and consistent beat, they auditioned and hired drummer Lee Kerslake, who had previously played with Daisley in Uriah Heep. It was slight compromise since Ozzy was gunning for Tommy Aldridge who was busy at the time. But Kerslake served the band’s needs, though he and Daisley would both later get ensnared in a legal battle for unpaid royalties. Other standouts on the album were the storming “Steal Away the Night,” the occult-themed “Mr. Crowley” the classical guitar instrumental “Dee” and the controversial “Suicide Solution.” Some thought the song advocated suicide, but it was actually a warning about the dangers of drowning in alcohol. Nonetheless, in 1984 after teenage fan, John McCollum, shot himself in the head, possibly after listening to the song, the boy’s parents sued the Prince of Darkness and CBS Records for encouraging vulnerable individuals to commit suicide. The case was dismissed by a court, which determined that Osbourne’s freedom of expression was protected under the First Amendment of the U.S. Constitution. Ironically, Ozzy and his bandmates were initially disappointed with the sound of Blizzard of Ozz. They blamed Tsangarides, who they fired, and promoted Norman to the producer’s chair. Though he’s not credited on the release, Norman strengthened the sound of the record and worked as Ozzy’s producer until 1986’s The Ultimate Sin. 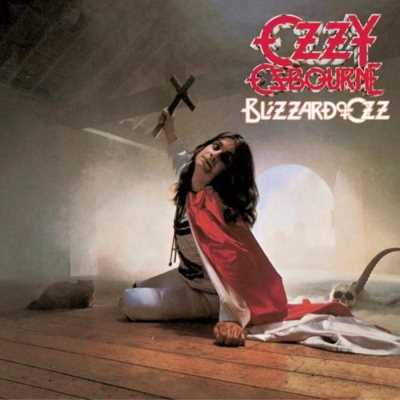 When the Blizzard of Ozz band finished the album, CBS Records created artwork that featured Ozzy’s name in large print and Blizzard of Ozz in much smaller font. Immediately – mistake or not – the album was considered Osbourne’s first solo album. In all likelihood, when the label realized how strong the record was, they figured it would be easier to market as the solo album from Black Sabbath’s former singer than as a totally new band. Some of that material was used on the follow-up to Blizzard of Ozz, Diary of a Madman, which was written quickly and recorded between February and March 1981. By then, Osbourne was still partying heavily, but he was back at full strength, able to record and perform exceptionally using muscle memory. All it took was a major injection of success. Blizzard of Ozz entered the Billboard album chart at No. 21 and it was No. 7 in the U.K. The album was certified gold July 31, 1981, and platinum June 18, 1982. To date, it has sold over four million copies in the U.S. In 2002 Osbourne reissued Blizzard of Ozz and Diary of a Madman, but since he had been sued by Daisley and Kerslake, their parts were re-recorded for the release by bassist Robert Trujillo and Faith No More drummer Mike Bordin, who was playing in Osbourne’s band at the time. Some fans were outraged by the move, which Sharon said was Ozzy’s decision, while the Prince of Darkness claimed he didn’t even know the albums were revised until after their release. A later reissue of the Blizzard of Ozz, which came out in 2011 to celebrate the 30th anniversary of the record, featured Daisley and Kerslake’s original bass and drum parts. The reissue also included the B-side, “You Looking at Me, Looking at You,” a previously unreleased version of “Goodbye to Romance” and “RR,” a Rhoads solo outtake from the original album session.